An EB-5 Investor Visa grants a green card to foreign investors and their family who wish to immigrate to the United States and invest five hundred thousand to one million dollars in a business that will also create at least ten full-time jobs for American citizens. That being said, simply applying for an EB-5 Visa does not mean that it will be granted. If the applicant is outside the United States, after the approval of their I-526 petition, petitioners will need to request an interview at a United States Embassy or Consulate abroad. 1. Why Is The EB-5 Interview Required? 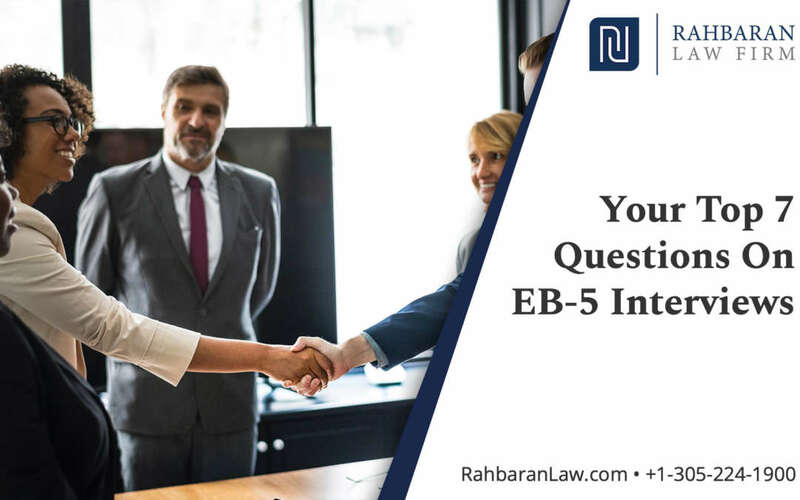 The EB-5 Interview is required to verify your supporting documentation, to assess your familiarity with your project, and to confirm that you are not subject to the grounds of inadmissibility. 2. How Do You Begin The EB-5 Interview Process? You will begin the EB-5 Interview process by first filing the DS-260 form online, which will begin the Consular Processing process to get you on track to obtain your green card. Taking the EB-5 interview is simply a component of the Consular Processing. 3. What Will The Consular Processing Be Like? The Consular Processing process officially begins when your I-526 petition is approved and sent by the USCIS to the National Visa Center (NVC). You will then be sent a request for the necessary documents you will need to provide and a list of instructions that you will need to follow. A date and location for your interview should be provided at this point as well, and it will be at either a United States Consulate or Embassy in your country of citizenship. 4. What Documents Will You Be Required To Provide? First and foremost, all documentation you provide must be original versions and not copied. 5. What Questions Will You Need To Answer At The Interview? • What is the current status of your project? • What date did you file your I-526 petition? • What date was the petition approved? • What is the name of the commercial enterprise you’ll be investing or invested in? • Can you describe the commercial enterprise you’ll be investing in? • Do you have all the necessary documentation? • Are there any factors that would make you inadmissible? • Do you have any past criminal activities? You’ll most certainly be asked several more questions beyond those ones, but those are the above questions that you will be almost guaranteed to be asked. 6. What Will The Actual Interview Be Like? Expect to wait in line for several hours at the consulate or embassy before taking the interview, so be sure to arrive early. There’s a very good chance that you will need to wait well beyond the scheduled time for the appointment. When you arrive at the consulate or embassy, the clerk on staff will need to verify your documents. When your turn comes, a consular officer will call your name to come into their office. You’ll be placed under oath, and the officer will then review the contents of your application. Once these contents and documents have been reviewed, the consular officer will then proceed to interview you using the above questions or any others he or she would like to ask. Some consular officers will ask you a wide variety of questions, while others will only ask a few. It really depends on the officer you get, meaning that the overall interview process can be either very short or very long. As a general rule of thumb, however, expect the interview to last at least thirty minutes. 7. What Do You Need To Do After The Interview? At that point, upon successful completion of the interview, all that you will need to do is wait to be approved and receive your visa. After the interview, you will receive your visa if you are indeed approved, but DO NOT open it. This is because the visa will need to be presented unopened to the United States Customs and Border Protection when you arrive in the United States, a green card is normally mailed to a U.S. address within 30 calendar days upon your admission into the United States. Please note that if you present an opened envelop for the Customs and Border Protection, you could be denied entry into the United States. If you would like to discuss the possibility of getting your EB-5 process started, please contact us here.